The International Baccalaureate Diploma Program is a rigorous college-preparatory curriculum for 11th and 12th graders. Begun in the 1960s in Geneva, Switzerland, IB was intended to serve internationally mobile students preparing for university. Today, there are three levels of IB -- the Early Years Program, Middle Years Program, and Diploma Program -- which together serve students aged 3 to 19. Currently in Littleton Public Schools, the only IB program is the DP at Littleton High School. The IB curriculum focuses on international-mindedness and related traits clustered in the IB Learner Profile. As such, IB students are: inquirers, knowledgeable, thinkers, communicators, principled, open-minded, caring, risk-takers, balanced and reflective. Students who commit to the International Baccalaureate Diploma Program for their junior and senior years adhere to an LHS IB Agreement. They and their parents sign the agreement and agree to follow its protocol. To view this policy, please click here. 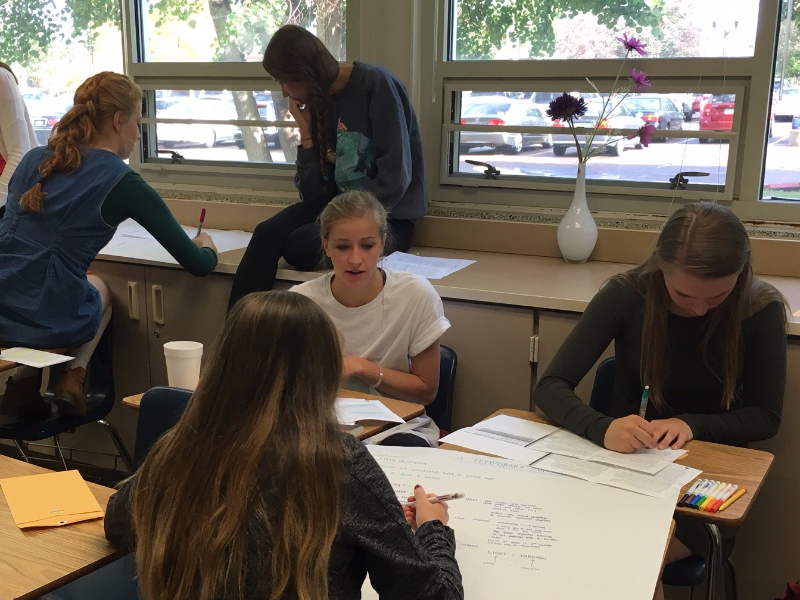 Littleton High School students follow an Academic Integrity Policy. To view this policy, please click here. All students in Littleton Public Schools must adhere to the district's Student Code of Conduct. View the code by clicking here. The International Baccalaureate Organization holds students to a high level of academic integrity. To view the IBO's Guide for Academic Honesty, click here. General Regulations for schools authorized by the International Baccalaureate Organization to deliver the IB Diploma Program, is available here. These regulations guide schools in their roles and responsibilities, and provide important information to IB students and their parents/guardians about academic honesty/misconduct, IB assessments, and more. All students in the program, particularly prior to the May exam period, must read and understand these regulations. They and their parents/guardians must sign an agreement stating receipt and understanding of these General Regulations. See Ms. Anderson or Mrs. Stulock with questions or concerns. To view the General Regulations in Spanish, please click here. These are the traits of an IB Learner, developed by the International Baccalaureate Organization, based at The Hague. Much of our work at Littleton High School, particularly within the IB, is rooted in these qualities as we prepare to send citizens out into the 21st-century world post-graduation. Students complete a range of assessments during their two years in the International Baccalaureate Diploma Program. Assessments take a variety of forms: oral, written, group and individual, papers, experiments, presentations, and other projects. Some components are graded by the LHS IB teachers (internal assessments) and others are sent around the globe for grading by experts in their particular subject areas (external assessments). For each of the six subject areas, students can earn a maximum of 7 points. A matrix of 3 maximum "bonus" points may be earned by completing the 150 hours of CAS (Creative, Activity, Service) and the Theory of Knowledge presentation and essay, along with the 4,000-word independent research paper called the Extended Essay. To earn a diploma, students must gain at least 24 points (out of a possible 45). What, exactly, are SL and HL? International Baccalaureate subjects are categorized as Standard Level (SL) or Higher Level (HL) based on the number of teacher/student contact hours. Generally, SL courses are one year long and include 150 teacher-contact hours; HL courses are two years and have 240 teacher-contact hours. To earn an IB Diploma, students must take at least three -- and not more than four -- HL courses. All LHS IB Diploma students take the same HL English Literature course and the same HL European/20th Century History course. For their third HL course, most students take IB Biology and some take HL Math, while others take HL Visual Arts, HL Music, or HL Design Technology. For a look at the current, four-year, IB-track course sequence, including LHS graduation requirements, please click here. The Extended Essay is a 4,000-word independent research paper on a topic of the student’s choosing. 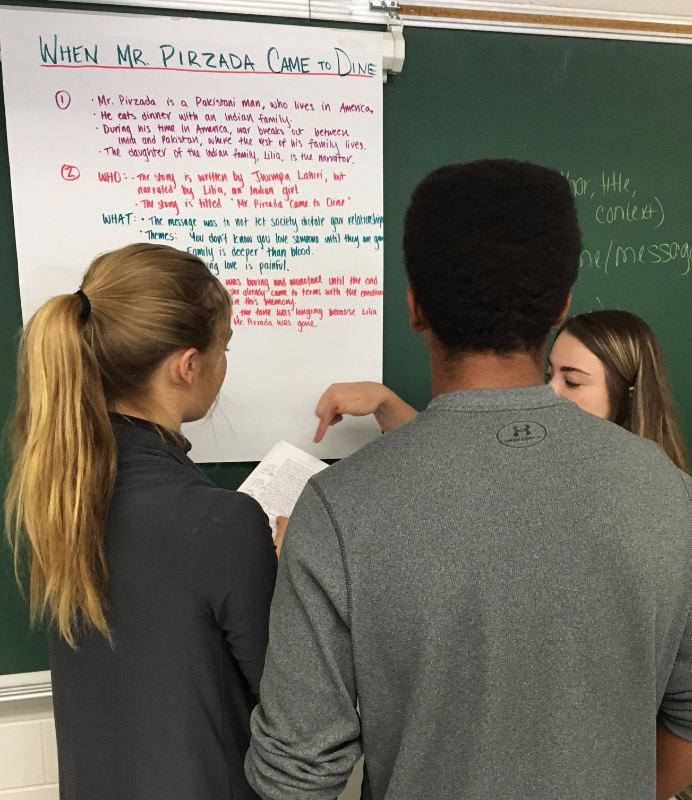 Students begin this project in the spring of their junior year, do the majority of their reading, researching and drafting over the summer, and complete the essay in the fall of their senior year. Each student chooses an LHS teacher-adviseo work with throughout the research process. Extended Essays are sent around the world to be graded. The EE is unique in that it enables students to become original researchers in a field that interests them. Most students find the process worthwhile and beneficial in preparing them for work they’ll do in college. We offer a variety of Sixth Subjects, most of which are Standard Level (SL), one-year courses. Some Sixth Subjects are offered at SL or HL (Higher Level) and stretch over two years. See Ms. Anderson, Mrs. Stulock, or the subject teachers for specifics. Our Sixth Subject offerings are Visual Arts, Music, Design Technology, Chemistry, Sports Exercise and Health Science, Global Politics, and Psychology. The Lions Lore can be found by clicking About LHS and looking under the Academics Section. Littleton High School students are fortunate to have academic choices, as we have a very strong IB program and a wide array of Advanced Placement courses. To read a brief explanation of the differences between IB and AP courses and assessments, please click here.